The View From Bolton St.
And I always respond the same way. “I am not too busy for you!” So I wanted to take a moment in this weeks reflection to let you all know that I really am NOT too busy too meet with you, to connect with you, to hear what is on your mind and your heart. The role of pastor is primarily to help connect people to God, to serve as a bridge between you and the divine. We offer this in many ways, through worship, through bible study, through service to the community, through our prayer ministry and through individual and small group pastoral sessions as necessary. And we can always do more of this if there is interest. Things are, of course, busy here at Memorial. There is always a lot going on. We are (and have always been) a small church with a big church mind-set. Which is wonderful. But when it comes to the things that really matter; the thing that matters the most to me are your hearts, your souls, and your relationship with our Lord and Savior Jesus Christ. All the other things are of course important, but between ensuring the bulletin is checked and this newsletter goes out on time and your soul, I will pick your soul everytime. This week Memorial started a music program over at Mt. Royal. The students will learn the basics of singing in a chorus and a selection of songs centered on Black History Month. This is a free Choral program for Mt. Royal that Justine Koontz will be leading. 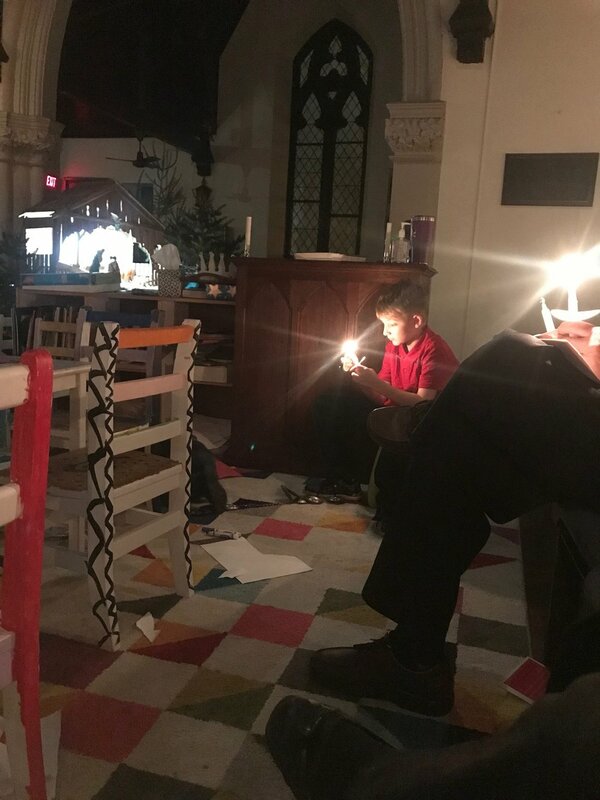 Join us for two important ‘Liturgy and Living’ Sessions the next two weeks as we review the 2019 Priorities and Budget in advance of the annual meeting. You won’t want to miss these informative and important conversations with the rector. Friendship Hour will be alot like sunday school. With this new name Memorial hopes that children will be excited to come and will feel open to inviting their friends. In this hour before church we will be diving deeper into the scripture for the week by doing some reading and crafts. We will be doing this while the adults tackle the scripture and other relevant content at the same time. All are welcome to Friendship Hour and Liturgy and Living. Get to know our Vestry Nominees! Fionnuala "Finn" Fox-Morrow is a Project Manager for an infrastructure construction company and her main focus is on MDOT Ancillary Construction Contracts. She says: My favorite projects are on the Light Rail, and specifically Howard Street as my family used to own an antique store on Antique Row. I was born at Union Memorial, my grandparents were married at Corpus Christi, and I wanted to worship in the city because my life is in the city. For a long time I had been struggling with where to call home spiritually since I was not raised in any particular denomination, and through the loving guidance of the Wells family, I gave Memorial a try! 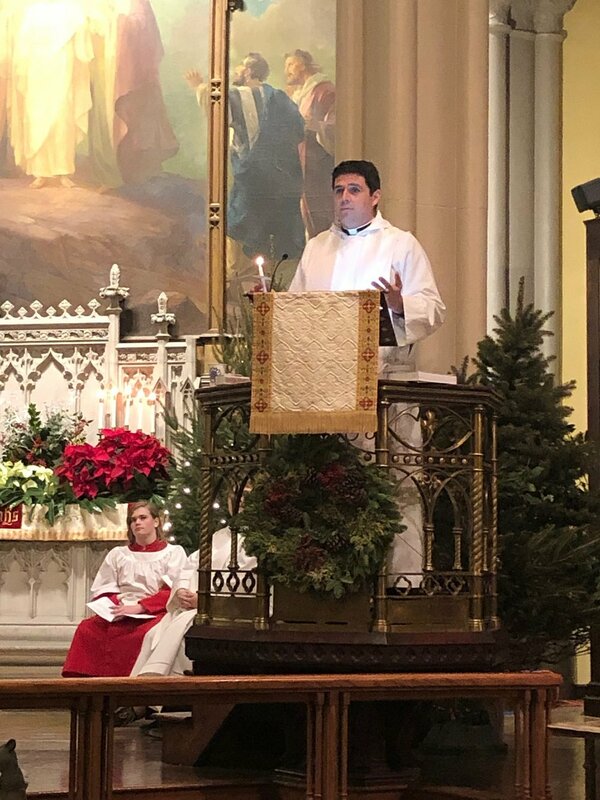 I feel called to serve because this congregation and the Episcopal church have filled me with such joy, and I want to share that joy with everyone that feels out of place and lost as I felt entering those doors for the first time. Finn is mom to Millie and Alistair. Fred Gorman has worked at St. Mary’s Outreach Center as a Case Manager for the past 4 years. He shares: We help the Elders of Baltimore age in place by providing case management for government programs, such as SNAP, Medical Assistance, MEAP, etc. I have always been called to serve, whether it is as simple as acknowledging a stranger or explaining the inner workings of the Maryland DSS to an Elder in a way they understand. I look forward to being of service to the church we call home. I have been married to my best friend, Sue Gorman for the past 18+ years. We have two wonderful daughters, Katherine and Rebecca. I cannot imagine watching them grow up without the influence of our family around Memorial. 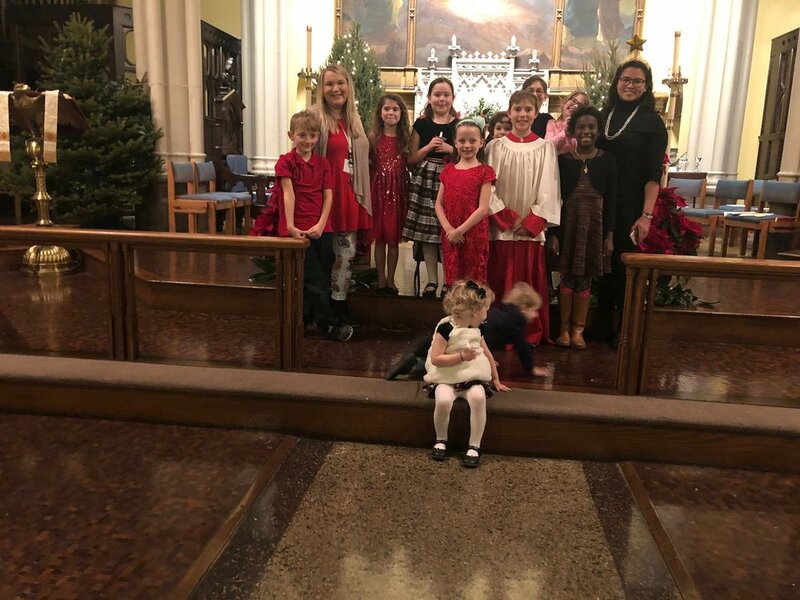 The Gorman Family came to Memorial at the invitation of Jennifer Pelton and the Memorial Players production of ‘Oliver!’, became Thesbians and then Episcopalians. Kaitlin “Kaite” N. Vaught, J.D., currently serves as a Judicial Law Clerk for a Family Magistrate in Baltimore City Circuit court. Upon passage of the Maryland State Bar Exam she plans on practicing international family law in the Baltimore-D.C. metro area. Moving here from Kentucky, Kaite was looking for a church home and had yet to find a place where she felt welcomed. Until she found Memorial. She joined Memorial through the Memorial Players after being cast in Romulus in the fall of 2016. During the course of the performance she found a church that welcomed her with open arms. Memorial has since become her family away from family. Since then she has been in one other fall drama and has worked on the spring musical as stage manager. She will be joining the choir after the bar exam is over at the end of February and is excited to serve her church family in any capacity she is able. Kaite lives in Bolton Hill with her ginger cat fur baby, Hamilton. Alex Scott (Dr. Nathan A. Scott III) has been a member of Memorial Episcopal Church since 1999. He grew up in Chicago. His father was a professor at the Univ. of Chicago, who later became an Episcopal priest and a Canon Theologian of St. James Cathedral. His mother was an economist, and was the first African American woman to be named a vice-president of the Federal Reserve Bank in Chicago. After she and her husband retired as the first tenured African American professors at the Univ. of Virginia, she received an honorary degree from Virginia Theological Seminary for her service to the Episcopal Church. Alex and Carol moved to Baltimore in 1986, with their two sons, Kade and Douglas (who was baptized at Memorial). Alex is a primary care physician (internal medicine), who has worked for Johns Hopkins Health Systems (1986-2006) and for Jai Medical Systems (2006 to present). He has averaged 3500-4000 patient visits a year for the last 30 years. His recreational interests include running, writing a philosophy blog, and attending jazz and chamber music concerts.In 2017, Alex helped bring the University of Maryland Art Against Violence exhibit to Memorial. He also helped organize a program on the theologian Dietrich Bonhoeffer that featured a film and panel discussion. In 2018, he helped start a college scholarship fund for Baltimore high school students called the Memorial Episcopal Church Young Scholar Award. He's also a member of the Book Club. Alex has always found Memorial Church to be a welcoming place for people of all cultural backgrounds, and a place that encourages freedom of self-expression. He attends the Faith at Eight service on Sundays, and likes to read poetry during the reflection period. Alex sees himself as an evangelical Episcopalian. Evangelical in the sense that there's no contradiction between being evangelical (in the true sense of the word) and being concerned with social justice. Evangelical in the sense of being passionate about Jesus Christ. Evangelical in the sense of loving god "with all your heart, and with all your soul, and with all your mind" (Matt. 22:37). As a vestry member, Alex will hope to spread the good news of Memorial, to participate more fully in its ministries, and to help remove all barriers--social, racial, and generational--to becoming evangelical within the Episcopal Church. Rita Walters is currently Chief Development Officer for Catholic Charities. She has worked in non-profit development for more than 15 years, serving organizations such as Big Brothers/Big Sisters, Baltimore Reads, Baltimore Presbytery, JHU School of Arts and Sciences, The Washington National Cathedral and MICA. Before her career in fundraising and institutional advancement she spent 15 years working in finance and accounting. Rita is married to Troy and has two sons, Chaz and Chandler. Rita is a faithful member of the 8am worship service at Memorial. Happy New Year! You might be surprised to know this, but being Christians that follow the Liturgical calendar gives us a heads up when it comes to figuring out what will happen in the New Year. To start with we are already a month ahead! 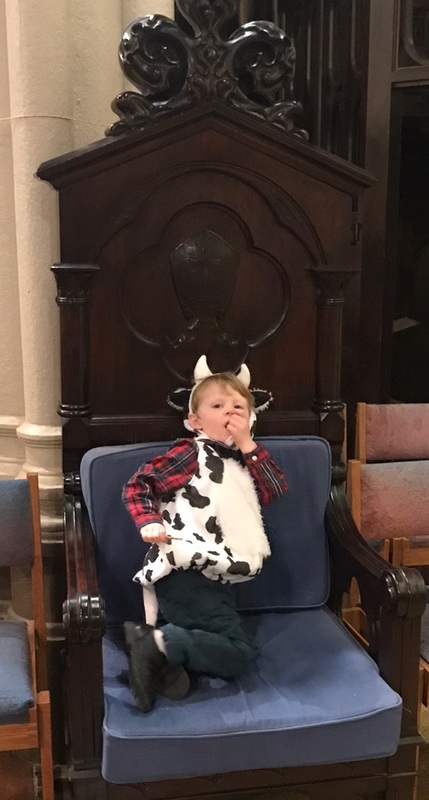 The Church calendar begins on Advent 1, which this year was December 2nd, so you all already know what’s in store for the next month. There is a lot of preparation ahead, to get ready for the changes and challenges of the year ahead AND in revisiting the mistakes of the past to prepare for a better present and future. 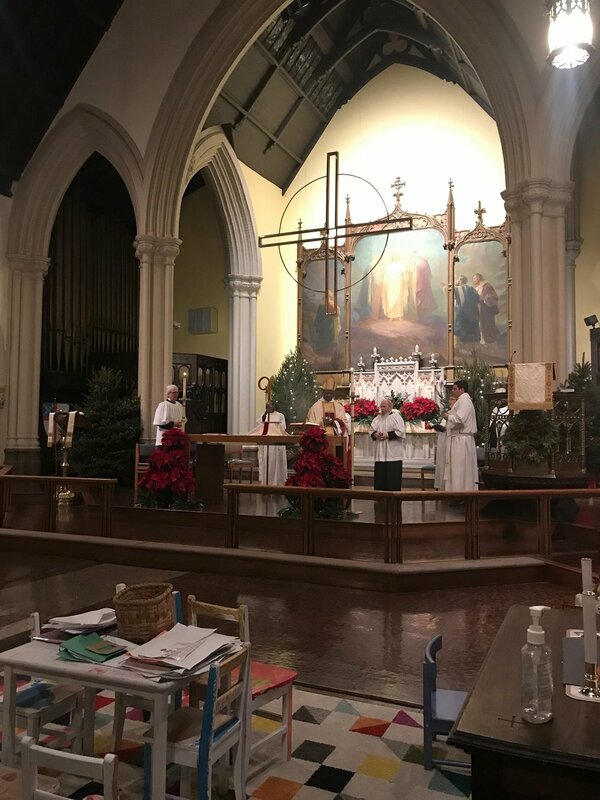 What’s more, our Liturgical calendar gives us a strong heads up about the rest of the year as well. After about a month or so, it is probable that our life will change dramatically! You might say we will have some kind of EPIPHANY and figure out what God is asking for us for the next year, or even few years. Initially, of course, this is pretty exciting! And whatever that Epiphany looks like - a new job opportunity, a change in political leadership, a new personal relationship, or a new leadership opportunity - we will be ready to jump in feet first. But, as usual, after a few weeks we will recognize that this epiphany is going to take a little bit of work. And we may not be up to the task. It will take a season of repentance, reflection, and perhaps some reconciliation to get us really ready for that epiphany. This LENTEN season will last, oh 40 days or so and finish dramatically (we hope) with a RESURRECTION moment! A reminder that, wherever we are in life, God is not finished with us yet, and the Church isn’t either! We will feel like new people, however this resurrection appears to us, and it may even give new clarity or renewed vision to that epiphany we had earlier in the year. As we continue to lean in to that resurrection moment, we will find ourselves suddenly imbued by the Holy Spirit and life may seem to suddenly get ORDINARY. But that ordinary time will be nothing but ordinary. It is the time when we do the hard work of building the kingdom; of putting meat on the bones of our Epiphany visions - whatever that vision is for you! A better marriage, a more rewarding career, stronger friendships, a clear legacy, or maybe just a two year old that goes to sleep at a reasonable hour. And that ordinary time takes us through summer into fall and towards the end of the year. And 2019 will end like most years: with some joys and some sorrows; some big celebrations and perhaps a few worries, Hopefully we will be able to look back and recognize that progress has been made and that you, and we and our communities are in a better place than at the start. Okay, it may seem a little cheesy to map out the year like this. But there is some value to having a defined yearly routine. It can give your life meaning and purpose when that feels like it is in short supply; and it can offer a way to process the joy and pain of regular life in the context of the church year. Perhaps most importantly, it means that no matter how stressful, anxiety producing or frustrating the world is, we are always encountering it through the lens of the life and ministry of Jesus Christ and his disciples. We are grounding ourselves in something more permanent than the twitter-machinations of politicians, the ups and downs of the stock market, or just the daily stresses of living in Baltimore City. However 2019 turns out, I am grateful to be spending it with you at Memorial and am looking forward to the Epiphanies that will surprise and delight us over the next year. Join us for the Feast of the Epiphany this Sunday! 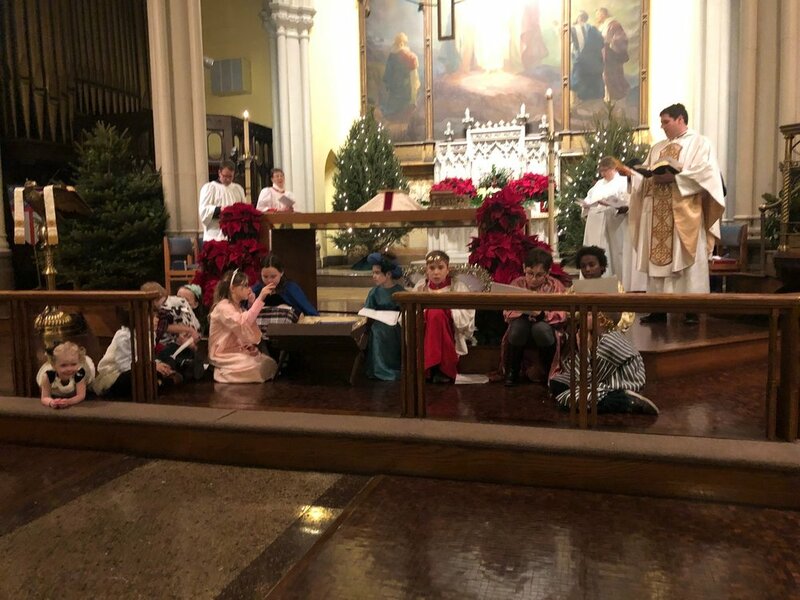 This Sunday, January 6th, we will be celebrating the feast of the Epiphany with a special guest preacher, a children’s choir, and the annual ‘chalking of the door.’ Please join us for this important feast of the Church and your welcome back to Church in 2019. The Reverend Robert Wright Lee, IV more commonly known as Rob is a Statesville native who received his Masters of Theological studies in May of 2017 from Duke University Divinity School. Rob completed his undergraduate work in religion and Appalachian Studies at Appalachian State University where he met his wife Stephanie. He currently serves on faculty at Appalachian State as a Lecturer. In the winter of 2018 Rob started his doctorate of ministry in spirituality and storytelling. Rob is a columnist for the Statesville Record and Landmark in the faith section. He has written extensively for both secular and religious news outlets. Rob's work has appeared in outlets such as NPR's Weekend Edition, The State of Things, The View, MTV's Video Music Awards, Ministry Matters, the Methodist Federation for Social Action, the Huffigton Post, the Common English Bible: Student Edition, and the Washington Post. He has preached all across the country from churches with 10 members to churches with 4,000 members. He currently serves on the Day 1 Ministries Advisory Board. Rob's first book is titled "Stained-Glass Millennials", the book explores the relationship between the institutional church and the Millennial generation. He has recorded sermons for Day 1 Ministries and his second book, A Sin by Any Other Name with Penguin Random House which is due out on April 2nd of 2019. Rob lives in the piedmont of North Carolina with his wife and poodle Frank.